One way to indulge in other cultures is through music, and that is precisely what Mare Nostrum offers its listeners. Mare Nostrum, Latin for ‘Our Sea,’ is a radio show that airs every two weeks on Wednesdays from 8-10pm Central (GMT – 6) on WEFT 90.1FM, a volunteer operated community radio station in Champaign. 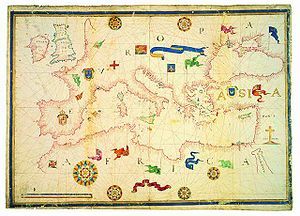 The phrase Mare Nostrum was first used by the Romans to refer to the Mediterranean and the countries along its shores that they once ruled to include contemporary Spain, France, Italy, Slovenia, Albania, Malta, Greece, Turkey, Cyprus, Syria, Lebanon, Israel, Palestine, Egypt, Libya, Tunisia, Algeria and Morocco. So when tuning into Mare Nostrum, a listener can expect to hear the sounds of any of these countries. Mare Nostrum aims to showcase both the common experiences of the Mediterranean people, as well as the unique features of each of these countries. Studies. She is well informed on the cultures of many of these Mediterranean countries, with Greece holding a special place within her academic interests. If Marina’s expertise in the area of Mediterranean Studies is not enough to entice you to tune in — which you can do live from anywhere in the world via the web—then surely the fact that Mare Nostrum has been continuously on air since October 2009 should. All of Marina’s past playlists can be found here. One thing a listener may take note of is that each show is structured around a common theme, whether it is a genre of music, a historical period, or one country. Champaign -Urbana residents and members of the U of I academic community who are natives of Mediterranean countries are frequent guests on the show, adding an extra element of authenticity to the discussion and the music. In addition to shows dedicated to specific countries, some of the themes covered recently are: music of the islands, music for children, jazz, rock, hip-hop, flamenco, classical, and more. You can find more information about each show's theme and the dates when the show airs on the Mare Nostrum website. Even if you can’t be on the shores of the Mediterranean, you can experience the sounds of the Mediterranean by listening in to Mare Nostrum. Be sure to catch the next airing of Mare Nostrum on September 21, 2011.